Introduced by the Lisbon treaty, the European Citizens’ Initiative is intended to make the EU more democratic by giving one million EU citizens from several Member States (at least a quarter) a new opportunity for a more direct say in its policies. There are already a number of initiatives planned to be submitted after ECI comes into force in April 2012. This is when the Regulation governing the operation of the ECI, Regulation 211/2011, comes into force. The Green Group in the European Parliament launched the ECI community website for ideas and proposals from citizens. On this site EU citizens can exchange ideas and organise to start an initiative together. Among the ideas for future ECIs presented on the website is “Europeans for fair roaming”, an initiative that calls for a borderless European market for telecommunications. At the moment, the team for the initiative consists of five people and is supported by 9 organizations, that represent about 120 000 people; 7 Members of European Parliament and around 1500 people through social media like Facebook, twitter, and the initiative’s newsletter. The majority of the people are just following, however, there are some people who are very actively supporting the initiative. Let’s have a look what initial steps “Europeans for fair roaming” took to launch the initiative, which can be a useful example for the future ECIs. While forming a group for the initiative, it is important to suggest a simple demand formulated in simple words that everyone can understand. If there is a package of 5 demands that work well together it can still work, but disadvantages usually overweigh advantages in this case. First, it is too much information. Second, people can say that they like demands 1, 2, 4 but do not like demands 3 and 5. 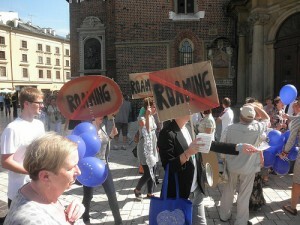 “Europeans for fair roaming” have come up with a simple concern that is shared by many European citizens. It is essential to research what the European Union has already done on the issue and if there are any plans to do something. For example, in 2007, the first EU regulations on roaming were adopted. Now it is therefore a peak time of activity for “Europeans for fair roaming” as the current regulations expire in 2012. It is a perfect chance to influence the decision. Therefore, it is important to keep an eye on the actions of the EU about the issue concerned. The problem that “Europeans for fair roaming” had at the start of their campaign is common for any small group of individuals: no one knows you. You really have to call every small organization or individual that may add credibility to your idea. Many people that the initiative core group emailed did not answer or if answered they often said that they supported the idea but they would get back to you later. It is hard to explain why it is like this, but it can be quite dispiriting. “Europeans for fair roaming” have sent a great number of emails to many different actors, for example to MEPs. Only few of them replied, but their replies were fast and enthusiastic. It is better to try to meet MEPs in person, organize debates or meetings. It is common knowledge that talking to people is much more effective than sending emails, but this is a hard task for new or small initiatives because of high travel costs. As a result, building a network takes a lot of time and effort. However, it is an essential part of work. At the beginning it is important to start a network. For example, you can set up a Facebook page, invite your friends, the friends of your friends etc. It is a good way to check if the initiative is going to work. If after some months there are still very few supporters, the idea may not be successful. But at least no money was spent. Another challenge on the way to a successful initiative is finding a financial support. Promoting the initiative and gathering signatures costs money. The initiative group for Fair Roaming realized they were not receiving as many donations as they hoped. As a result, all the work with the initiative is voluntary at the moment with small amounts of support from Europe United and MEPs. In this case, advertising is crucial. Start online ads (Google, twitter, Facebook). It will not cost a lot of money (cheaper than press work or going into the streets) but will get a lot of people on board. While gathering the network and sending messages, it is significant to think of things that keep people inspired to go on. Communicate any successes that your campaign has and talk about why it is important to do what you are doing together. If you see an interesting article linked to the initiative, send it to people! Keep communicating and motivating your followers. On July 6, 2011, the European Commission published their proposal for a new EU roaming regulation that will help to further bring down prices for using a mobile phone when abroad, and it already took up a lot of initial demands of “Europeans for fair roaming”. The latest roaming debate that was held in the European Parliament at the end of September 2011 showed that there is great support from Parliament members from all different groups. “Europeans for fair roaming” are currently working on compiling a catalogue of possible improvements to the European Commission proposal on roaming. At the moment the group even think that probably the submission of an ECI on fair roaming will not be needed. The Commission has already responded to the initiative and hopefully all the concerns of the initiative group will be answered. This is a good example of how even an idea for an ECI can already be successful. However, “Europeans for fair roaming” are very positive about the new ECI tool as it will make it easier for the European citizens to communicate with EU institutions and propose a legal act. Moreover, as there is already a considerable support gathered, “Europeans for fair roaming” are planning a new campaign with similar demand that will take a full advantage of ECI. Though, at the moment the campaigners see some potential difficulties for new initiative groups to propose an initiative. First, it is a difficultly for a small group with no big organization behind to find the base of supporters and finances. The second is uncertainty about collecting signatures in different member states because of dissimilar privacy laws in each state. According to the regulation, signatures will have to conform to the requirements of the Member State from which they derive their European Citizenship. The members of the initiative group believe that the culture of support for ECI’s will be needed to be built. This will include practical support for the initiatives; kick starting campaigns and access to experts and professional tools. On the other hand, the Commission is obliged to provide help for ECI in the form of a “comprehensive and user-friendly guide”, “support and guidance to the organizers during the registering and processing proposals” and information by the Commission to the organizers of intended legislative proposals on matters raised by the initiative. The Green European Foundation has done much work on the providing European citizens with the practical information about ECI in order to make an effective entrance onto this new stage of European politics. European Citizens’ Initiative Handbook has been published as a guide to this new instrument. Moreover, GEF made the flyer “Ten steps to a successful European Citizens’ Initiative” complementing the in-depth backgrounder. We plan to continue working on this issue, and we hope that the new European Citizens’ Initiative right can make a real difference for the future of European democracy. This article was written following an interview with Bengt Beier, “Europeans for Fair Roaming” campaign coordinator.